Every thing has a cyclical manner, some more than others. And when price and the cycle runs together, it great to be in it for the ride! 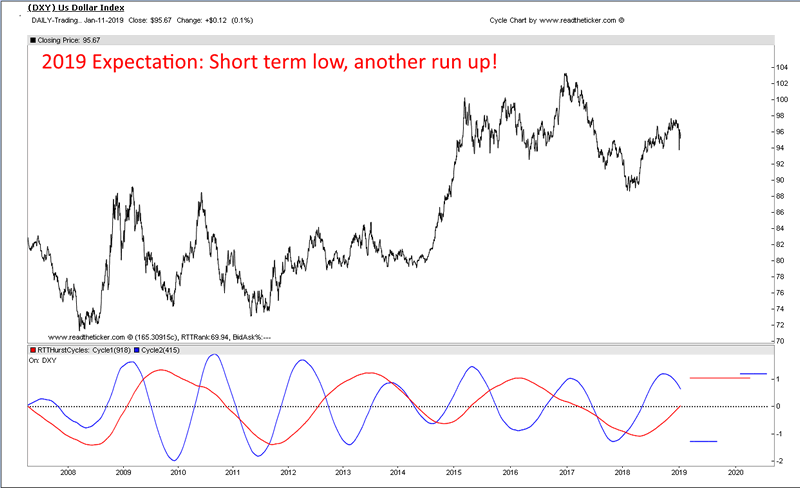 Of course fundamentals are the reason for a price move, yet the laws of nature seems to co ordinate fundamentals, price and time together, hence the outcome can be seen via a sine wave cycle. If you use some math called 'Bartels' (more here) you can scan many sine waves periods to see if they fit into your price time series, each time series will have it's own characteristics, some cycles will be a better with either a daily, weekly or monthly periods. Back testing the cycle is critical, as cycles do come into form and fall out of form, but over time they do add to the investors arsenal while working out the next risk reward price move. Consider these possible big movers in 2019. Chart: Gold stocks to gold. Chart: USD or DXY index. There are some big moves coming in 2019, cycles help the investor judge each one.